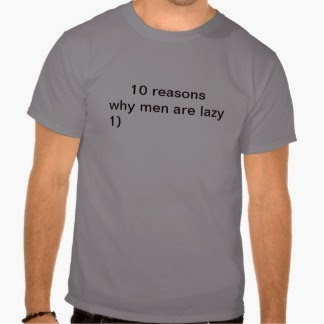 I will get to the last 5 reasons men are lazy, but probably not in this blog. I received some thoughtful comments about the subject from a male reader. He suggested that my title should be amended to suggest that SOME men are lazy but not ALL men. I took his suggestion. It's true some men are lazy but not all men. His comments were thoughtful and strong. He said, "Will you however admit that amongst your gender there is growing number or spoiled, uncontent, that wouldn't be happy if they married Jesus types (or lived in the garden of eden?!)" Yes, he's correct. He added, "My point being the general attitude within the church and amongst women these days (along with the media, etc) is that men are lazy. I mean we are supposed to put in our 40-60 hours and then come home and play Mr. Mom, all the while keeping up the outside "men's work" chores of changing the oil, mowing the yard, fixing the plumbing, etc." Very often this is true. He also suggested that I define "lazy". I took his suggestion. I decided to not use a dictionary but God's Word.There are numerous verses in Proverbs (email me and I'll give you the list) which speak about a lazy man. Definitions include words like: laxness, slackness, slackening, deceit, treachery, a slack hand. In Matthew 25, Jesus tells a parable about a LAZY servant. In verse 26 He describes him as "WICKED" and "LAZY". Bible concordances describe the word lazy as SLUGGISH and SLOTHFUL. The Message describes it this way: “The master was furious. ‘That’s a terrible way to live! It’s criminal to live cautiously like that! If you knew I was after the best, why did you do less than the least?" "Why did you do less than the least?" Being lazy (and wicked) according to Jesus is doing less than the least you can do. It applies to women as well as men. According to the parable in Matthew 25, Jesus EXPECTS us to USE WHAT HE HAS GIVEN US and do MORE with it than when He gave it to us. If He has given you a wife.....love her MORE than the least you can do. If HE has given you children.. guide them MORE than the least you can do. If HE has given you a job..... work it MORE than the least you can do. Doing MORE with what you have been GIVEN is the OPPOSITE of LAZINESS. Being a LAZY person means NEVER caring about someone else's feelings; NEVER taking care of something that needs to be taken care of; NEVER going the extra mile, the extra foot, or the extra inch. The end result of this type of living is destruction. "He who is lazy is brother to him who destroys" (Proverbs 18:9) And so a LAZY husband is a DESTRUCTIVE ONE. And sadly, I know many women whose husbands fit that description. And having a lazy husband doesn't seem like such a big deal when OTHER people are dealing with an adulterous husband, or an addicted husband, or an abusive husband. Jesus points out.... LAZINESS IS NEXT TO WICKEDNESS. and my heart is to ENCOURAGE THEM IN THE LORD. And to let them know that they have a Friend in heaven. Dear wife: He intercedes for you. And you can pour your heart out to your Father. And He hears. And He is not happy when a wife has to live with a WICKED and LAZY husband. Dear wife: Look UP. Speak UP... but not to your husband.. but your FATHER in heaven. And... on a clerical note... if you sign up to receive this via email... be sure to follow up when you receive an email to verify your desire to receive this blog. And BTW... where are all of you coming from? Who is telling you about this blog? And THANK YOU for wanting to read it in your email inbox.